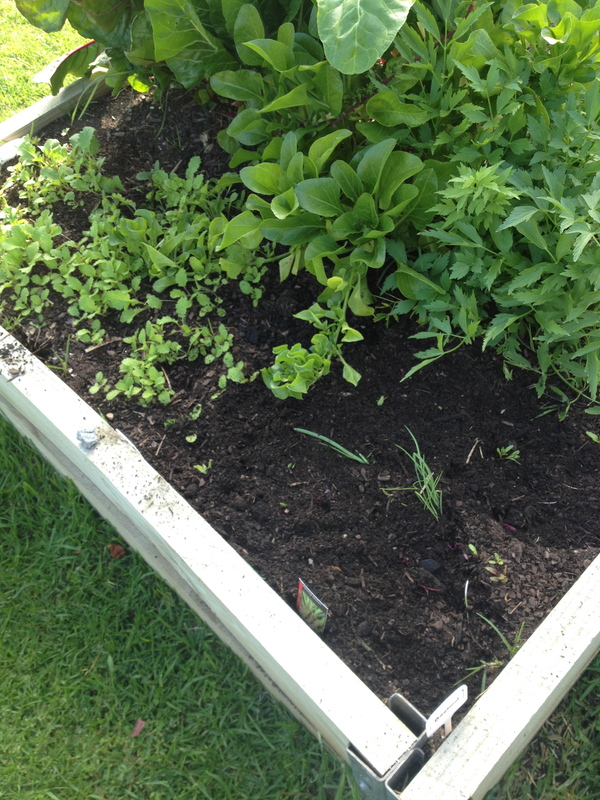 The refreshed raised garden beds. This one has turnip and betroot seedlings however one of the residents has been doing some gardening in the beetroots overnight. The garden clearly has required attention post Summer as veg like tomatoes and zucchini have died down after their premium fruiting period. Some of the other veg have limped along with the hazards faced over a difficult Kandos Summer with hail, followed by a massive dry period and strange bugs. Anyway, over the last month I have cleared out the old veg, extended the colorbond fence bed and replanted with vigour. 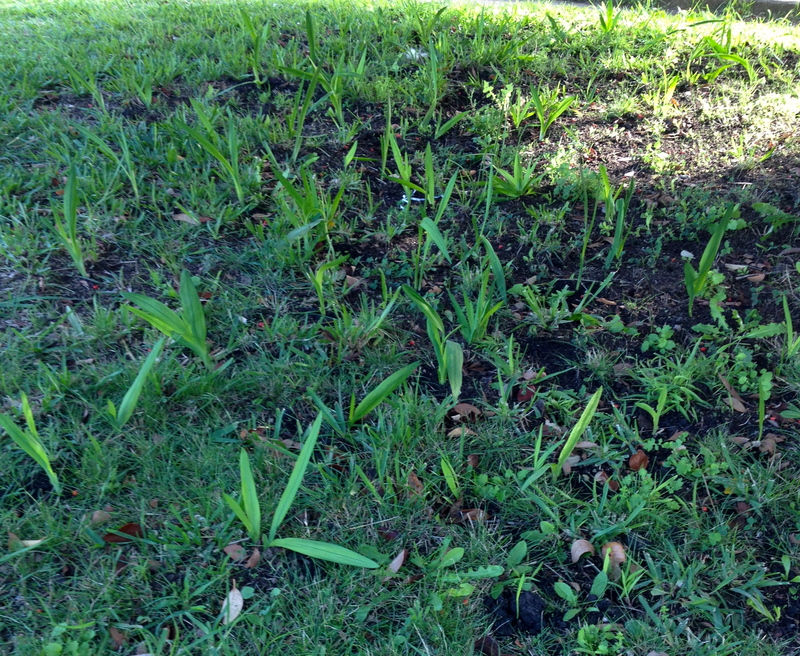 Hundreds of freesia bulbs are planted under the old cottoneaster – they are now peeking through. In regards to the non-edible but beautiful beds, I have gone to town with bulbs. Last year I invested in daffodils around trees (small and new as the trees are), snowdrops, grape hyacinths, as well as some normal hyacinths. The old cottoneaster had a healthy planting of grape hyacinths and many freesias. This year I have added to the beautiful deep Delft Blue Hyacinths, probably more than doubled the freesias under the cottoneaster with another 180 plus bulbs, added 100 bluebells to the garden (no idea why I didn’t plant any last year! ), planted ranunculus and anenomes in the front circular garden bed, whilst adding Autumn crocuses to completely fill out the edges, given the success of the incumbents and supplemented another 100 plus of the hard-working grape hyacinths. The high profile bulbs are the 40 saffron crocuses I’ve added, which I hope will at least provide some saffron to the kitchen larder. 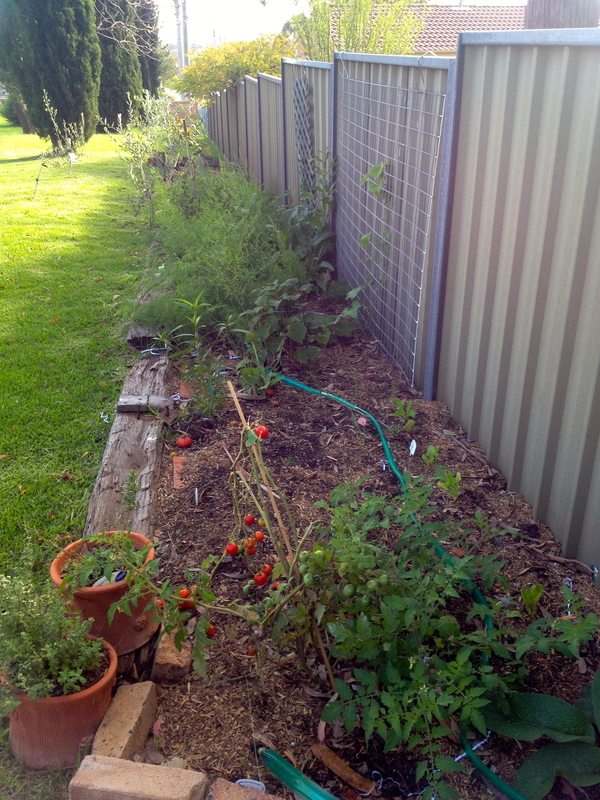 The never-ending garden bed down the colorbond fence – it just keeps being extended. Later it will also be home to potatoes. The veg beds are mostly cleared (some I don’t quite have the heart to pull out yet) and I’ve taken advantage of the significantly extended colorbond fence bed, to plant: lots of beetroot (I tend to hedge my bets with seedlings and seeds, which I can claim to be staggering planting but is more due to lack of confidence- and dogs), carrots – several varieties, mini cauliflower, broccoli, onions (red, brown and white), garlic, celery, celeriac, turnip, swede, parsnip, radishes … and probably more. Anyway, I’ve done my best in preparation for Winter veg. Beds are cleared, weeded, topped up and planted. The flowering beds have been weeded, mulched and fed. A little more mulch is required to finish off, but otherwise I’m pretty happy with the garden. The next garden challenges are to finish off the front garden bed along the wall. It looks great now but that’s because the salvias are at their best. These will soon die down and currently make up the middle layer of the bed. The roses and shrubs near the wall will hold their own but the smaller front layer of ground covers and smaller plants is non-existent. I need to put some thought into what will go here and how it needs to look good during the different seasons. I also still have the privet hedge to continue restoring and a small tree grove to establish. I’m not even thinking of the vacant block next door at this stage! The garden is always a challenge but always fascinating and rewarding in how it changes and the opportunities it presents each season. 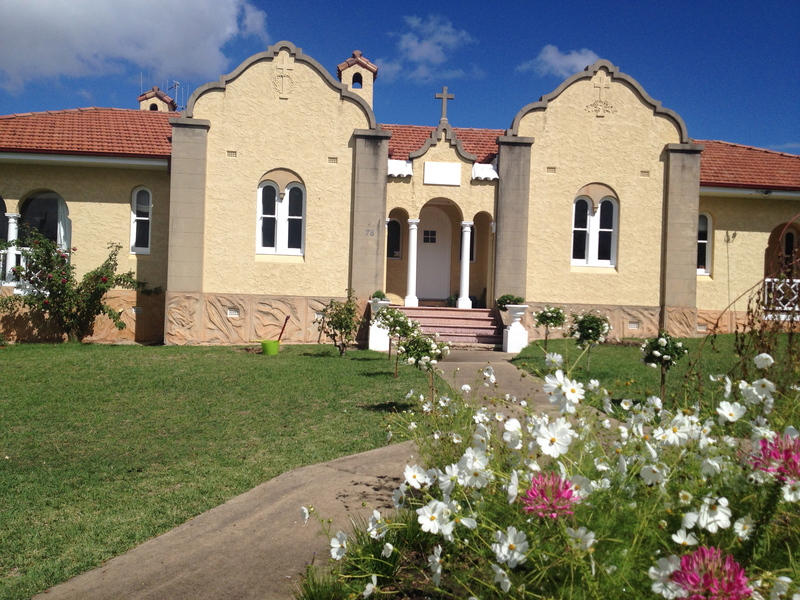 I’m liking the white flowers against the Convent with Cosmos and Icebergs. 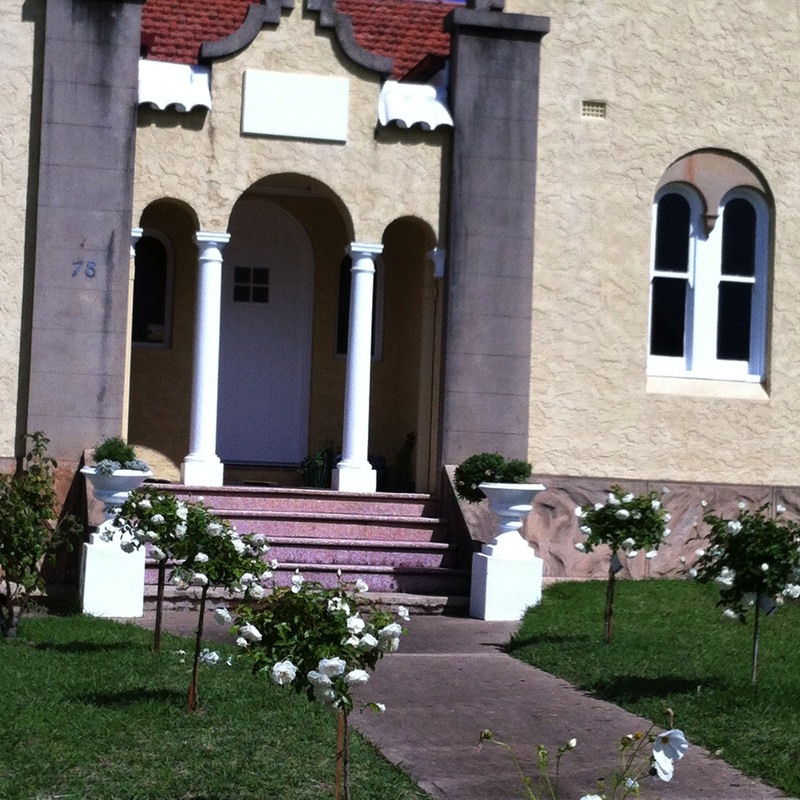 Two white Pope John Paul roses flank the front entry as well. The spade and bucket are marking where I will be planting two standard wisteria under the arched windows. Many thanks. Still so much to do and new dog means some of it has to be done a few times. 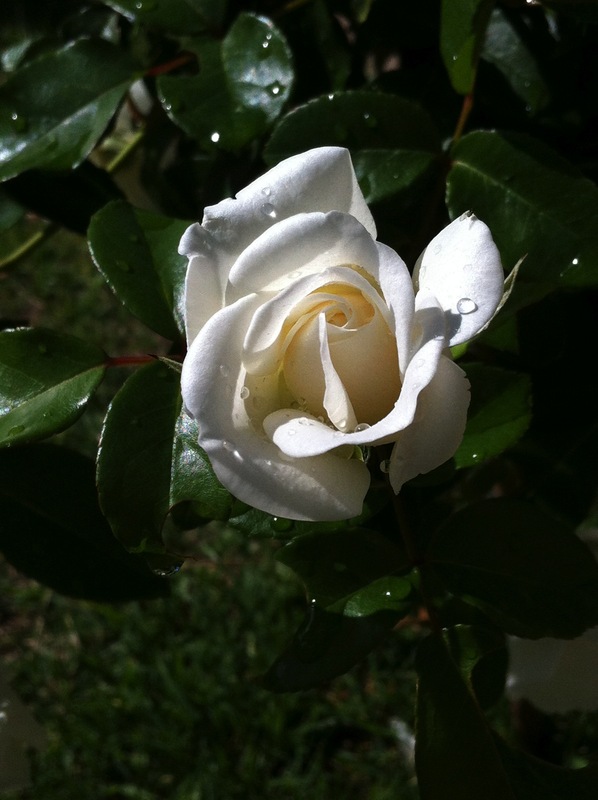 It’s rewarding to watch it grow so quickly and then change with the seasons.